Whether you’re looking for that perfect way to celebrate a birthday, you are searching for entertainment for a family vacation or you just want to break out of your routine, the answer you need may be in the middle of a medieval arena. Medieval Times Dinner & Tournament combines fantastic food and endless excitement, resulting in an evening it will be impossible to forget. While the Medieval Times Entertainment began in Spain in 1973, the first American castle was opened in Kissimmee, Florida, in 1983. As the country’s longest-running and most popular dinner attraction, Medieval Times has hosted more than 50 million visitors, letting each one experience the thrills of the 11th century. Headquarters are in Irving, Texas, conveniently located next to Chapel Creek Ranch where the show’s horses are bred and trained. Today, there are Medieval Times castles in California, Illinois, Maryland, New Jersey, South Carolina, Texas, Georgia, Orlando and even Toronto, Canada. Its success is recognized in part by the Trip Advisor® 2014 Certificate of Excellence, which is given to those companies that consistently lead their industries and have the highest reviews from customers. 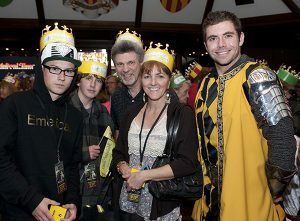 Athleticism, adventure and excitement can all be found in a typical evening at Medieval Times. Each section of the audience cheers for their Knight of the Realm as knights joust in an epic battle to see whether good will conquer evil. Along with majestic horses, incredible costumes, amazing riders and award winning music created by composer Daniel May, the show features falcons, drama and a story that will sweep you off your feet. The weapons are authentic reproductions from the 11th century, the costumes deserve to be featured in historic period films and the fight scenes will leave you breathless. Despite the stunts and adrenaline, the show maintains exceptionally high standards in order to guarantee the safety of the audience as well as the talented cast members. 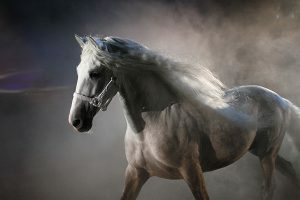 Keep your eyes open for the Andalusian horses, quarter horses, Friesian horses and Majorcan horses, all of which are trained according to the strengths of their breed. While the jousting knights and beautiful horses might steal the show, it is impossible to forget about the amazing meal that awaits each and every visitor at the Medieval Times Dinner & Tournament. You’ll want to arrive hungry, because the menu features a tomato bisque soup, tasty garlic bread, oven roasted chicken, BBQ spare ribs, herb-basted potatoes and a sweet apply puff pastry for dessert. Of course, guests are advised to remember that this 11th century show is true to history, and that means no utensils are provided. Dig in with your own utensils: your own two hands! Also included in this epic feast are vegetarian options and unlimited soft drinks, iced tea, water and hot coffee. 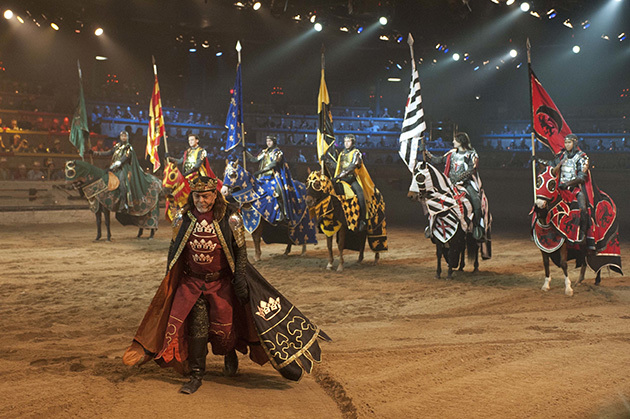 For more than 30 years, the Medieval Times Dinner & Tournament has been an awe-inspiring performance that is often the highlight of a family vacation. Suitable for all ages, this epic event is a world-class production that you have to see in order to fully appreciate. If you’re considering a partner to help you grow your independent travel agency, Travel Planners International is ready to help you get started with exceptional support and services. Contact us to find out more.